If you want to make your children have fun in a typical catholic feast in Sicily, what you have to do is rent a family villa in Sicily and join the Carnival in Acireale, near Catania. Full of colours, dances, music and traditional events, Carnival party in Acireale is the oldest in Italy and also the most beautiful of the island. From 1594 until nowadays this celebration still go on to fascinate both children and adults, both citizens and tourists. But why is Acireale’s Carnival so special? The answer can be found through the streets of the city in those days by the floats’ parade. This one is a typical custom in sicilian Carnivals, but floats in Acireale are huge and sophisticatedly made. That’s why people are open-mouthed and children get excited. Usually, this feast is set between february and first days of march, during the Lent period, and it anticipates the Easter period. This year Acireale’s Carnival will be from February 17th until March 5th whit many events to partecipate. First day starts at 16:00 with a big opening party in Piazza Duomo, followed by a opening floats’ parade to finish with a wonderful acrobatic exhibition. On Saturday, February 23rd, after buskers’ exhibition and floats’ parade, some famous italian musicians take part to the Acireale’s Carnival: dj Fernando Proce with Bianca Atzei and Cristiano Malgioglio singers will entertain people through a nonpareil show from 21:30 in Piazza Duomo. But if you or your children are cartoon’s fan, you can’t miss the events on Thursday, February 28th. In fact, this day is dedicated to cosplayers who will take part in a parade from 18:00 until 20:30 in Piazza Duomo. There, Giorgio Vanni, the italian king of cartoon soundtrack, will entertain children and adults with his show. Many other italian artists will take part in Acireale’s Carnival in the following days. For example, Renzo Arbore e l’Orchestra Italiana will perform on Saturday, March 2nd at 21:30 and after 24 hours will be The Kolors’ turn. Eventually, the italian actor Jerry Calà and his show will take shape at 20:00 in Piazza Duomo. Masks, confettis, toys and a lot of many other coloured things will be part of the party ensuring fun, recreation and laughs for a wonderful event in the town of Acireale. 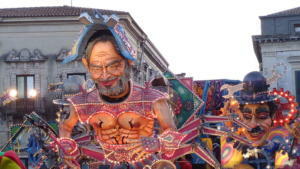 Top picture: Steve Jobs’ float during a parade in Acireale’s Carnival. Source: Wikipedia. Credits to: Effems.